Home Article Elliot DeGeneres, Father of Ellen DeGeneres Sadly Passed Away At 92: "He Was Always Proud Of Me." Elliot DeGeneres, Father of Ellen DeGeneres Sadly Passed Away At 92: "He Was Always Proud Of Me." Ellen DeGeneres's father, Elliot DeGeneres Died At The Age of 92. 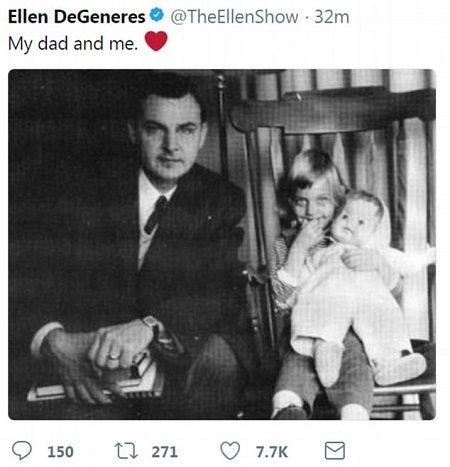 Ellen was very close to her father and brother, happy family. Elliot DeGeneres, Ellen DeGeneres loving father died this week which is heartbreaking news for the DeGeneres family. Elliot sadly passed away at the age of 92 and the Ellen DeGeneres Show host announced the unfortunate news on her show on Thursday, expressing all the gratitude and love she has for her late father. The second week of 2018 has turned out to be more of a nightmare for Ellen. With the horrifying mudslide striking in her residential area in Montecito and the death of her beloved father have taken a toll on the famous television host. The 59-year-old host revealed the sad news to her audiences live on Thursday stating that her father, a former insurance salesman is no more. "That is my dad, Elliot. That’s me when I was, I don’t know how old I was, but I do remember that picture,"
“He was 92 years old, he had a good long life, and he lived his life exactly how he wanted. He was Christian Science his entire life, he never had medicine his whole life — never went to a doctor. I never had a vaccination. We never had medicine growing up. And he lived to be 92." She also shared how her father was always proud of her, telling he was a very kind man and there was not one bone of judgment in his body. Ellen who's happily married to her partner Portia de Rossi also added she and her father had once visited a Warner Bros. lot when she was a little girl and now, she has her own lot, which always made him proud. Also, just 10 minutes before the death of her father, Ellen saw a rainbow shining in the sky just above her Warner Bros. lot which she considered as a gift from her dad. It was an emotional moment for Ellen! May his soul rest in peace.